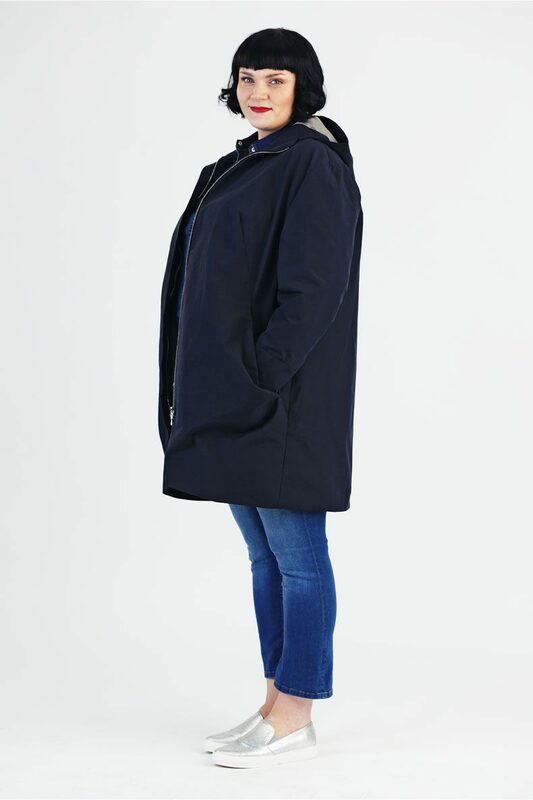 Sewing Pattern “Amy” Parka is a casual lined oversized coat with dropped shoulders, a comfy hood and deep pockets with folds. The zipper in the front is hidden by a facing. Have you seen? The Amy Parka is also available in sizes 34 – 46! Christina, the model, is 180 cm high and wears size 50. 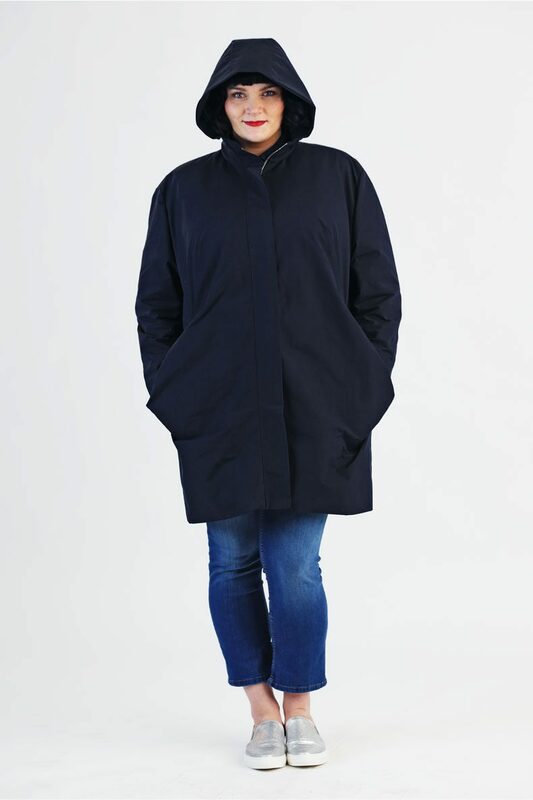 For the “Amy” Parka you best use more solid fabrics such as canvas, waxed fabrics or thicker woolen fabrics. For the lining all usual lining fabrics can be used. If you like your “Amy” Parka to be more cuddly you could also use some fur faux or plush as lining. With the purchase you receive a PDF to print the pattern at home, a PDF (DIN A0) to print at a Copy Shop as well as a PDF-file to print the pattern at our partner Patternsy. For this pattern we highly recommend a 1:1 print via Patternsy or a Copy Shop of your choice as the print at home version consists of quite a lot pages! The parka – a must-have for your wardrobe! 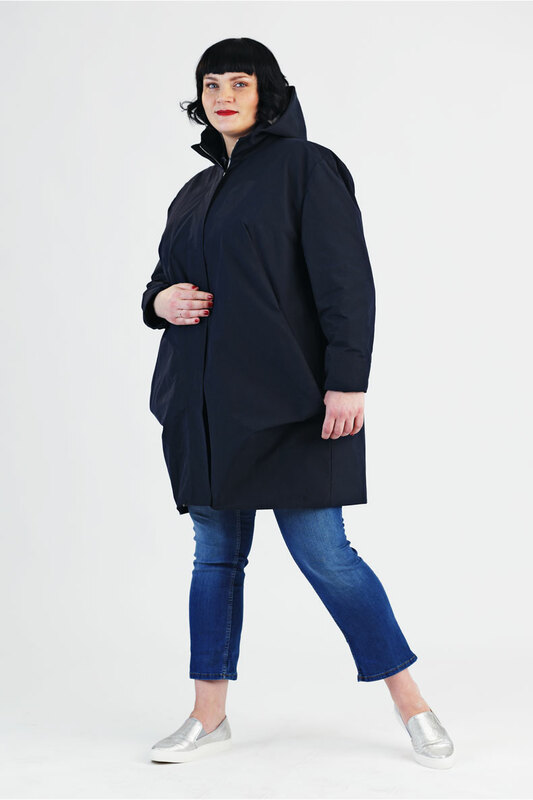 No longer indispensible in fashion is the parka, a mostly knee-length, lined anorak with a hood. 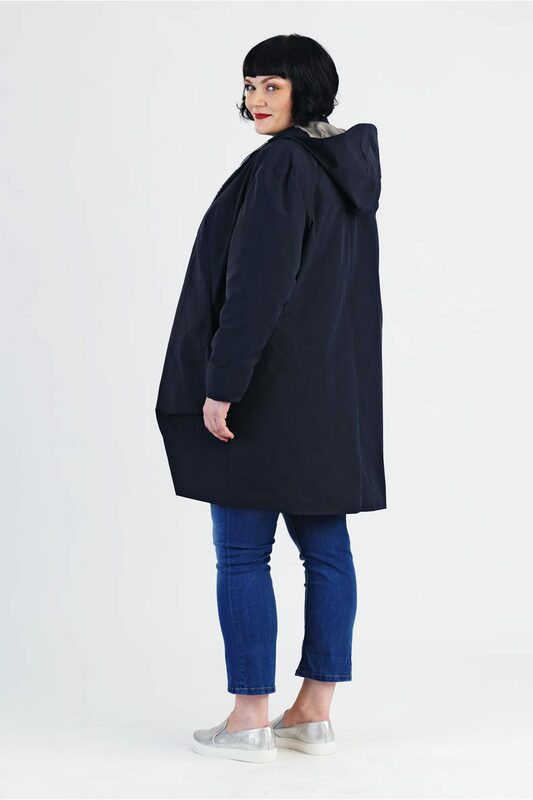 In recent years, the parka has shaped the street appearance like no other piece of clothing and was worn by both men and women in all possible variants. 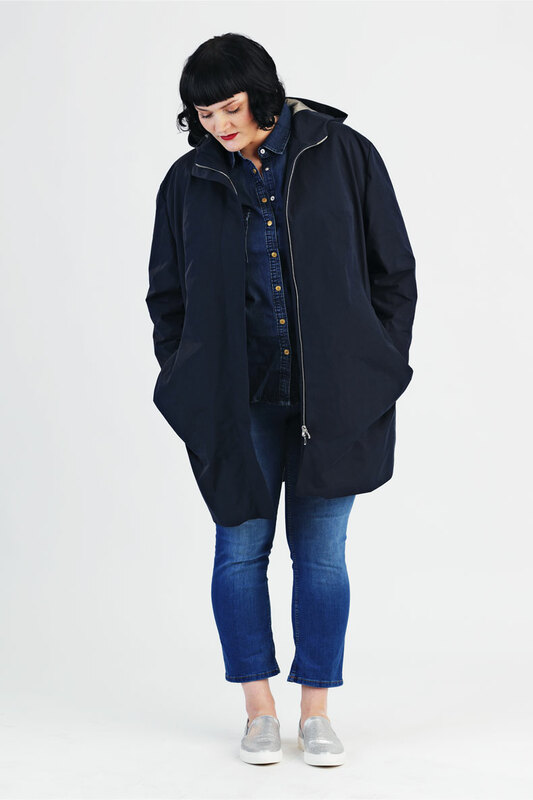 Also our pattern “Amy” Parky joins in this fashion myth “lined anorak with a big hood”. A special detail are the pleated XXL pockets that make the handbag almost obsolete for smaller trips. 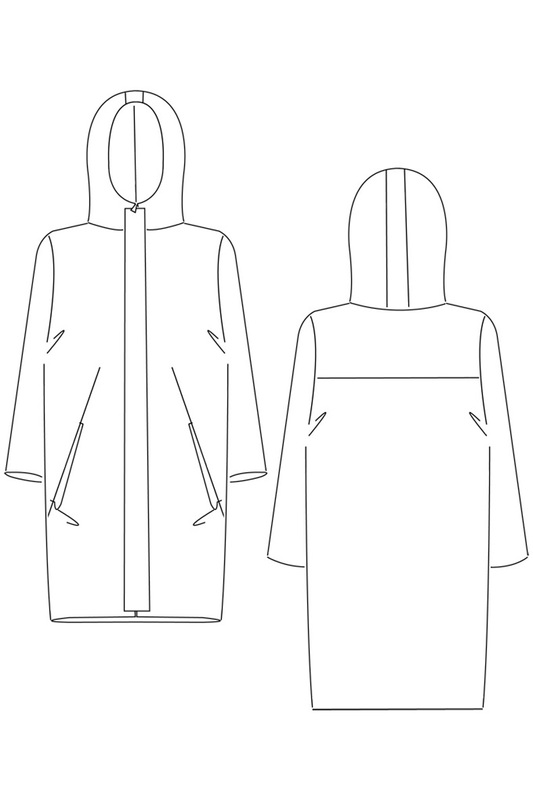 The Amy Parka is now also available as sewing pattern for larger sizes! This sewing pattern is available as pdf-download either to print at home as well as to print-at-copyshop (1:1). All files include sizes 34 – 36. You can easily hide the sozes you do not need and you can print the pattern black and white or coloured. Share your makes on Instagram tagging #amyparka @schnittchenpatterns!